Posted by Andrew Whyman under Technology, on 17 March 2017 @ 5:39pm. After a recent health issue I decided it was time to get myself a Fitbit to help me get into shape. I decided on the Fitbit Blaze which combines a smart watch and a fitness watch into one tiny device. I have to say for £140 it’s a very capable device and seems to work very well. Its main feature is a heartrate monitor and step counter, but it also includes a pressure sensor so it can tell when you have gone up and down stairs for example. It tracks heart rate 24 hours a day and uploads this via your phone to Fitbit. It does this at 5 second intervals except when you’re exercising. Using this it is able to estimate how many calories you have been burning during your activities. It can also monitor your sleep to determine how well you slept and for how long. I can say that it does work with some degree of accuracy as I do occasionally get up to use the toilet and it at least records this reliably. Although I have not yet put it through its paces with any proper exercise, I hope to do so soon. One of the features which I bought it for was reminders to move regularly which will come in handy given I have a desk job. This should prevent me from sitting down for long periods of time (at least that’s the theory!). Battery life is quoted to be about 5 days. Having had it for just a few days and only charged it once, I can say this is a likely length of time if not a day less than quoted. Smartphone notifications are I would say adequate but nothing special. If you receive a message it displays on the screen a snippet of the message. This applies to e-mails, instant messengers, etc. too. Each can be turned on and off in the app settings. Phone calls also come through but are delayed a little if you turn off ‘always on’ connectivity, which I have because it drains my phone battery like crazy. 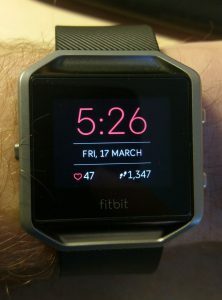 The Fitbit uses Bluetooth 4.0 LE (low energy) to minimise battery consumption. This is good but reduces the range of the bluetooth signal to about 10ft. Perfect if you carry your phone but otherwise you will definitely miss notifications from the other side of the room. That’s not a big thing for me since my phone is usually with me anyway. I’ll probably write a more detailed review as I use it more, but so far I’m enjoying the data it’s giving me.